Godfreig wrestled with the burning fire inside his head trying to recall where he was. The last he recalled was marching resolutely with his fellow farm hands under the stewardship of his Baron, towards what seemed to be an endless tide of savage green maws and glinting axes. His mind continued to slide back to the darkness pulling at his soul, the constant nagging to walk ever onwards as if drawn by some unnatural well. He stumbled on. Rounding the small copse, the burning inside his skull became stronger as he began to vaguely register other shambling figures resembling folk he dimly recalled. 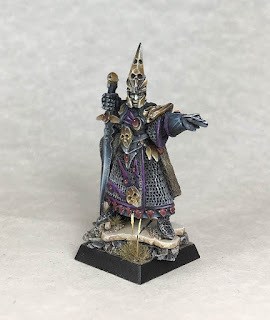 Turning back to where he was heading he caught sight of a wizened man hunched in discoloured robes, clutching a glowing staff of ebony coloured wood. As he fell into line with the growing throng his mind slipped away, replaced with the lobotomised command of a darker power. Lutheran Darkshade gripped the glowing talisman in his right hand and smiled as the legion of undead assembled before him. Well here is my entry, thought we could do with something big! 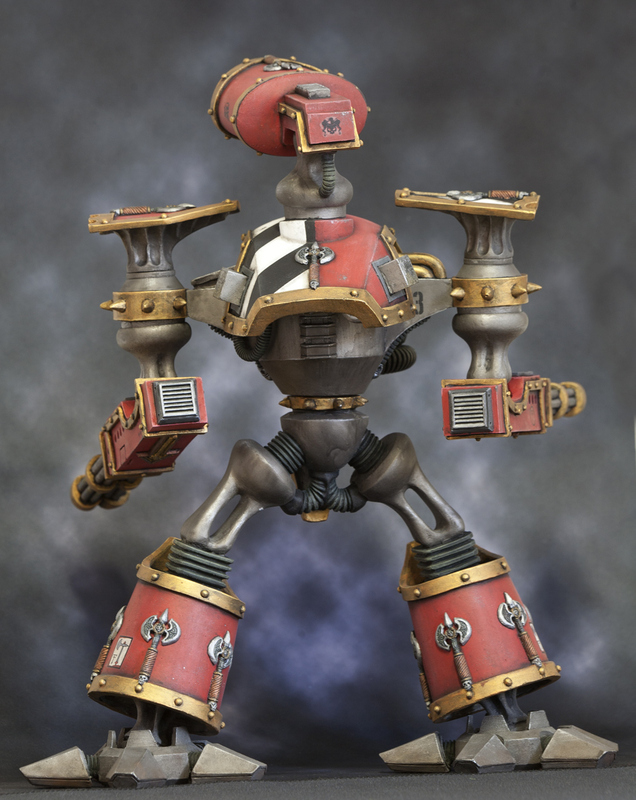 There is no theme or limit on the model you can pick, but the model must be a single fantasy or sci-fi figure of "28mm" scale. Well she's a single sci-fi model and 28mm scale so presumably counts! Can you forgive the background? I totally forgot whilst taking photos today. 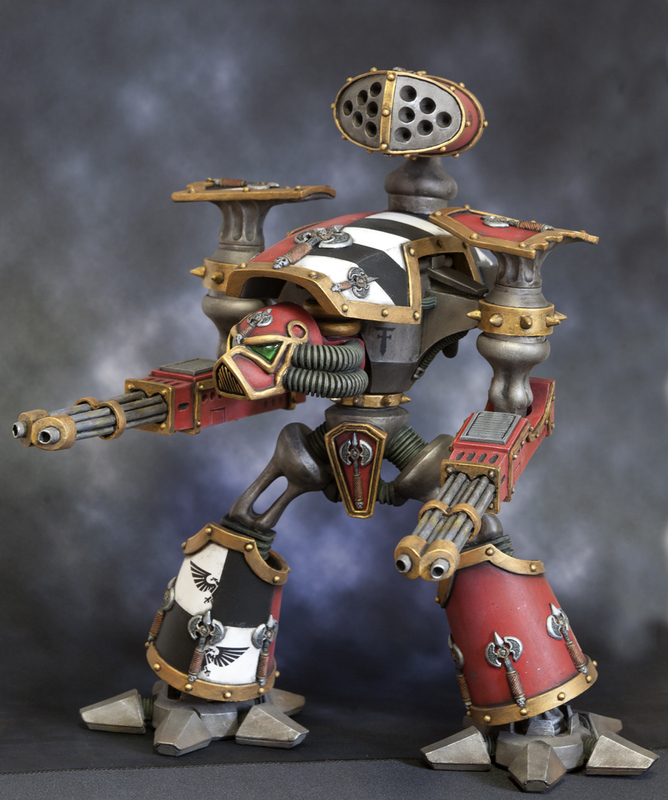 Well finally finished enough for display, my ancient Armorcast Reaver Titan, for those who remember. 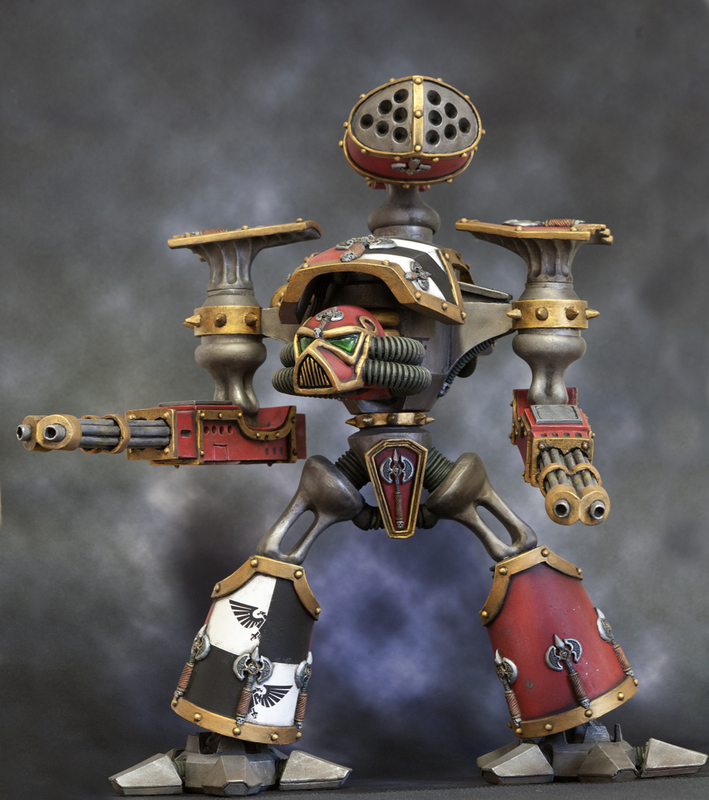 Colour scheme is Legio Metalica. A few small kit-bash additions to the torso, but pretty much stock. 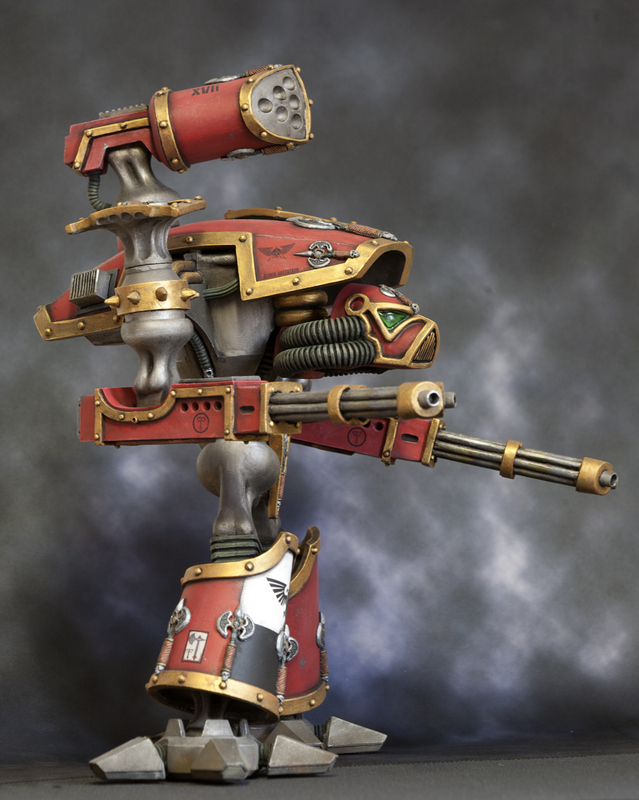 Brush painted this one in the end (I originally thought I was going to be airbrushing it), mostly Vallejo paints, with pigments for the shading, some citadel metallics for chipping (sponge method), Warcolour metallic for trim and detailing. Happy with the result, decided on a large model to try not to overdo shading and highlights and I think it's worked. Next step with her are the banners and some more grime and mud on the feet. Hope you like it. 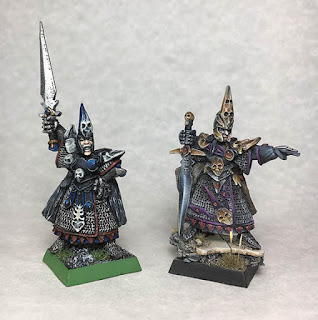 I am new to the board and in the oldhammer community. 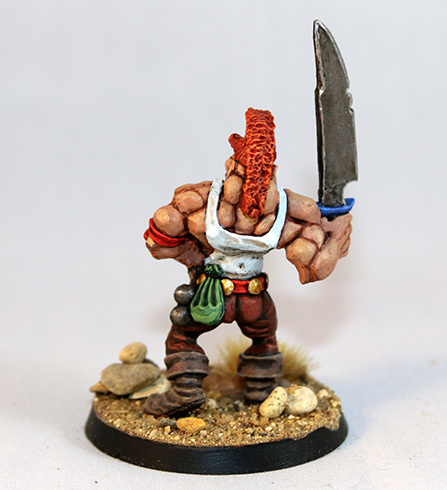 Evan if I am in the hobby since the 5th edition, I always prefered to paint the newer stuff. With my 20th anniversary in the hobby I thought it would be nice to return to my roots. Inspired by topics and blogs from the oldhammer community I get motivated to do my first step in this direction. 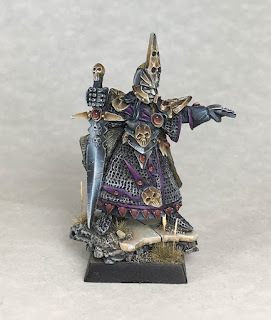 I grabed this old Dark Elves Champion and painted him to introduce myself to the Facebook site of oldhammer community. Now I get infected and can´t wait to rework through my old 4th edition stuff and to complete and paint my 3rd edition collection. So far to the background of this miniature. It is not scenic and roleplaying related, but a nice story to tell. Therefore, my scenic pictures are two pictures the Champions shows up with his old cousin, painted in around the year 2000. 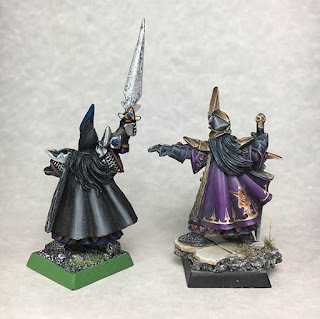 Not specific for this contest, as I am new in the community and found this topic first after the miniature was finished. 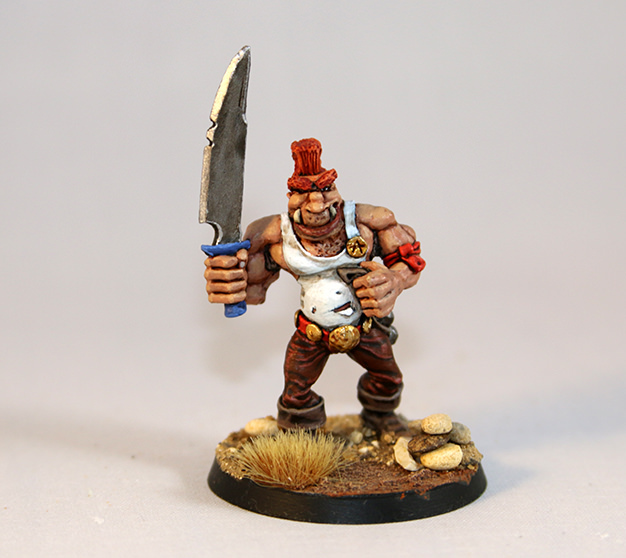 Bit it is the last miniature I have painted, so I hope that counts. Hi folks, I've been lurking on the forum for a while but the Golden Gobbo has inspired me to dive in a sign up! 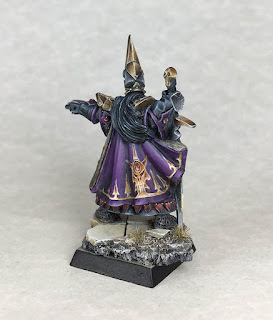 Here is my entry, painted specifically for this challenge: he has been sat in my lead pile for a goodly time while I built up the courage to paint him. I'm not 100% happy with the quality of the photos but they seem to be the best I can manage. ***Edit*** Sorry chaps I cannot seem to upload the photos directly so here are links to them. I will try to add them on the Facebook group also! "Mookerz was pleased with his new pair of leather trousers.They hadn't cost him much, apart from the time it took him to persuade the tanner into providing the leather at a significant discount and then convince the leatherworker to fashion them. Along with the new spiky hairstyle he sported, copied from those weird stunties he had seen, Mookerz was an ogre who was going places!" Some very nice entries, here is my effort. A goblin war turtle using a RAFM reptiliad war turtle, some Citadel goblins and a snotting and a goblin warbles from Avatars of War. Lots of very fine looking things here ! Here is my contribution - a Dark Elf 'Elspeth von Brutal' (owned him as a child - lost him and the rest of the box - but got him again as a gift recently) - face needs tidying but not enough light here now so dont look too close at 2nd photo. Nice one everybody. 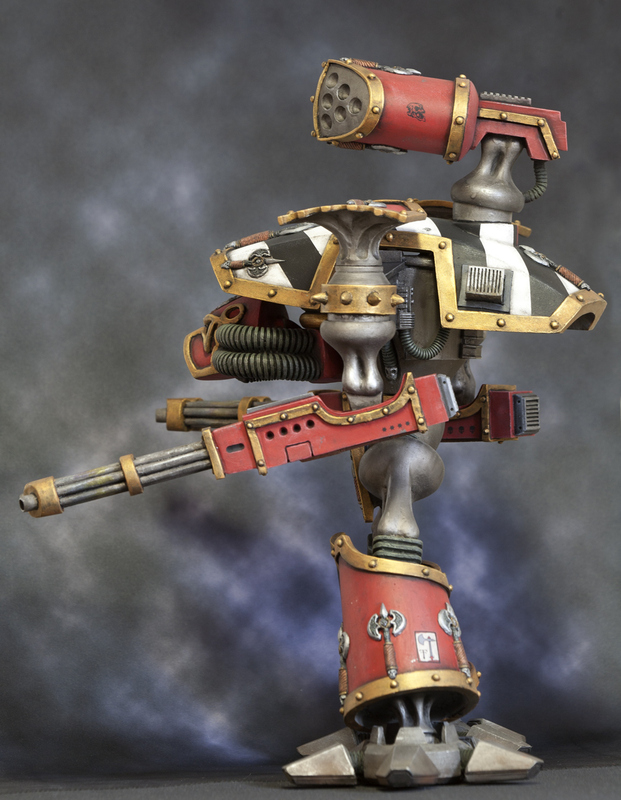 Delighted to see so many fine entries- and an armorcast titan to boot! So here is my entry. 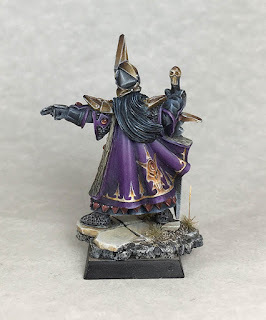 Sure it is not a Citadel dwarf but I like it very much. 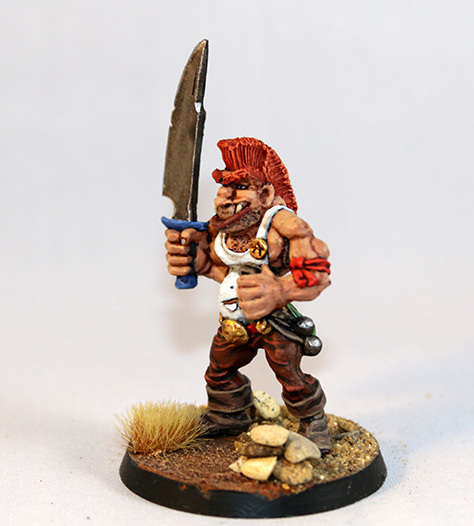 First post of a mini on this forum and first painted for 30 years. Finished it yesterday and tried to take descent pics this afternoon. And... that's it. Thanks everyone, I will get compiling a post for voting, probably have it up tomorrow.